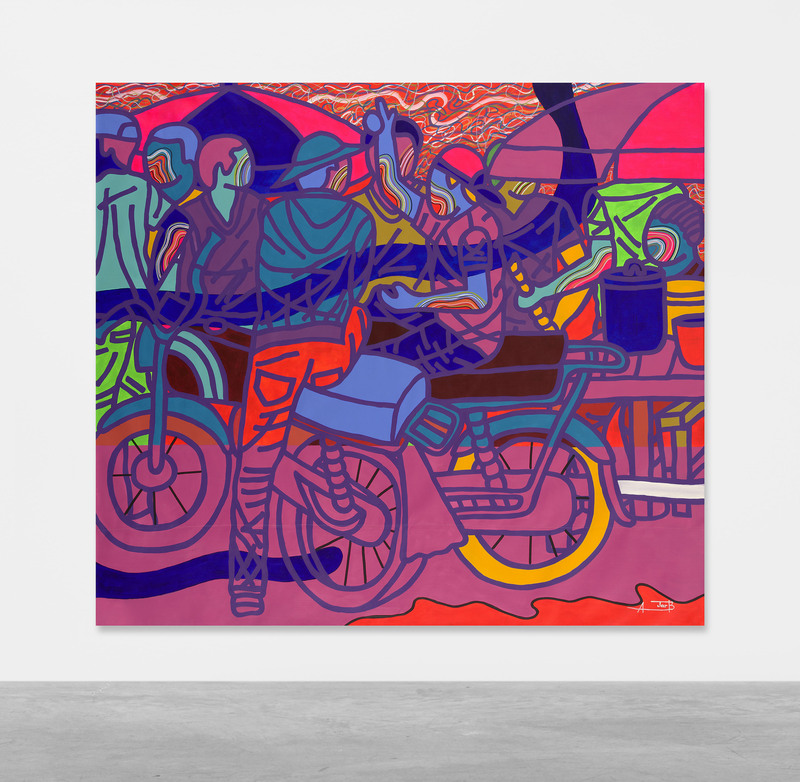 Peres Projects is pleased to announce its participation in the first edition of Condo Shanghai, where we will present new works by Ajarb Bernard Ategwa, alongside Grace Weaver (Koppe Astner, Glasgow / Soy Capitán, Berlin) and Wang Xiaoqu at AIKE. Ajarb Bernard Ategwa was born in 1988 in Cameroon, he lives and works in Douala, Cameroon. Ategwa’s large format works mimic the scale of cityscapes and public spaces, and his vivid color palette and graphic style speak the language of advertising familiar to inhabitants of Douala, Cameroon’s largest city and economic capital. 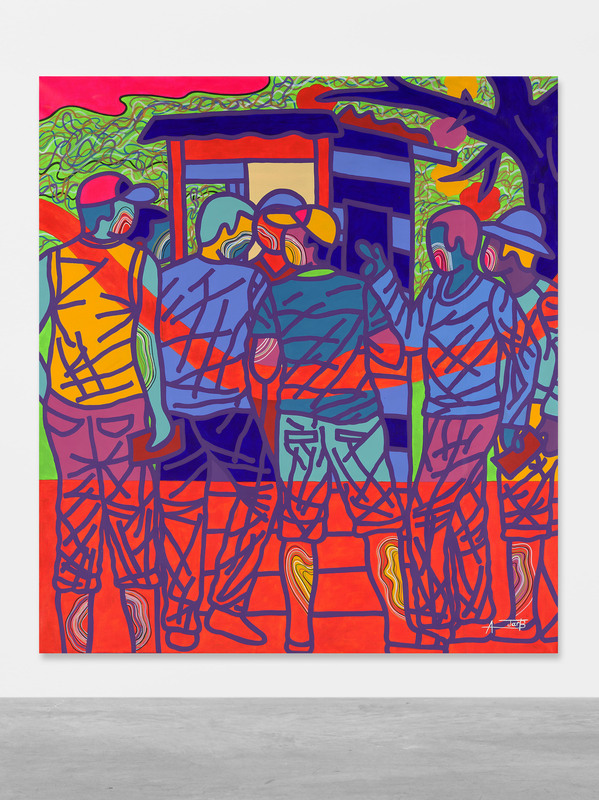 With a unique use of line and color, Ategwa weaves together these urban scenes, sounds and smells to create a rich sensory immersion. By using imagery lifted directly from present day Cameroon, Ategwa’s work counters these generalizations about the African experience with a nuanced perspective. 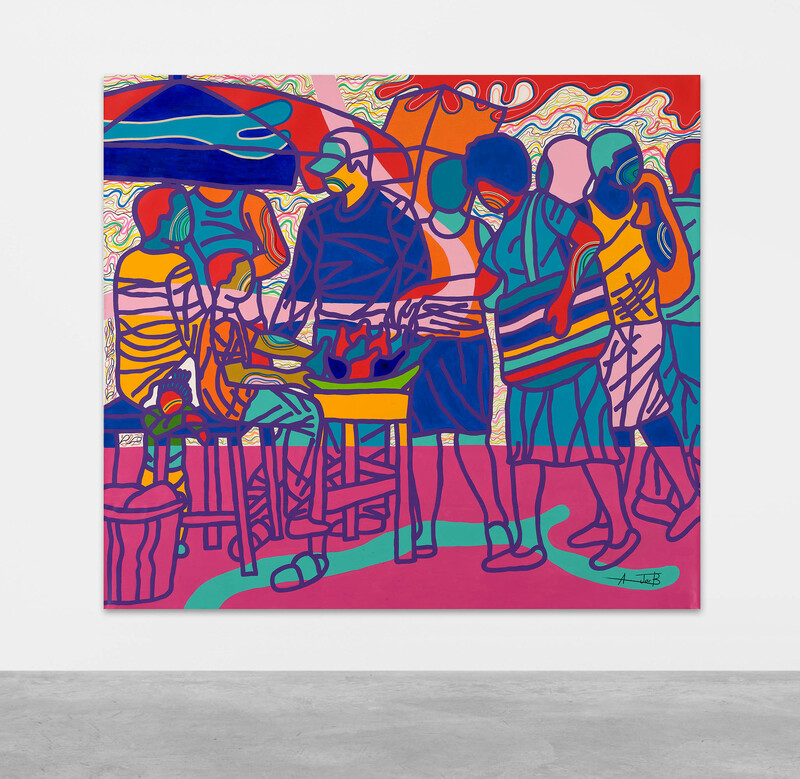 While deeply linked to the artist’s time and place, Ategwa’s abstract rendering of the human figure opens the door for all of us to see ourselves in his tableaux. Grace Weaver was born 1989 in the United State, she lives and works in New York, US. Weaver’s artistic practice aims to contribute a “girly” perspective to the history of oil painting. 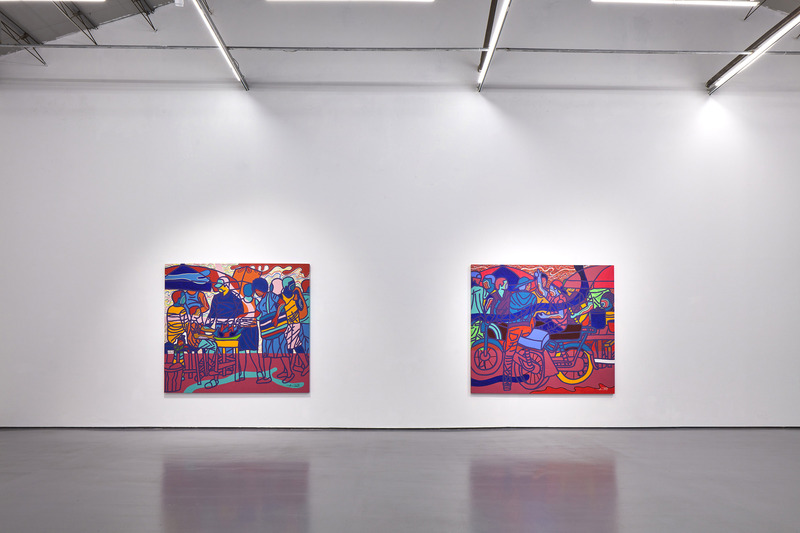 Mostly picturing multi-figure scenes, each of her compositions depends on a tightly managed under-painting whose forms rhyme and interlock to create the effect of a broad candy-colored tessellation. Within the discourse of painting, Weaver’s ambition is to contribute a voice that fuses art historical and pop cultural references into a new language that is emphatically feminine, championing the aesthetics of cuteness, whimsy, and girliness. Wang Xiaoqu was born in 1987 in China, she lives and works in Beijing, China. Wang creates environments and narratives that intertwine influences from theatre, comic books and common events. The idea behind her works stems from her own experience as a photographer in the past: She registers her perception of reality with the precision and detailed composition of a photographer and successively transforms that reality into the grotesque and surreal world, creating a unique visual experience. The result is an exaggeration of forms, volumes and proportions, and a black-humorous chronicle of daily events, where her characters stand still almost as sculptural elements. Wang is concerned about the fragility of subjective truth and the inherent inauthenticity of painting, and therefore, resisting any attempt to dig for deeper meaning. She keeps searching for an ephemeral connection between the subject of each image and the narrative plot generated by the figures that populate it. 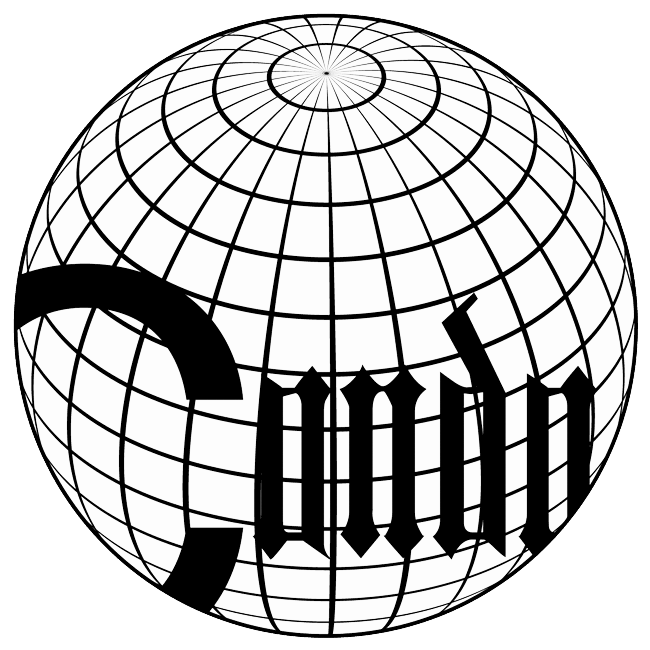 In 2016, Vanessa Carlos (Carlos/Ishikawa) founded Condo London as a way to offer international galleries a site for creative collaboration and exchange. It has since expanded to New York, Mexico City, São Paulo, and Shanghai. Condo will finally come to Shanghai in July 2018. “Condo” — taken from “Condominium” (com “together” and dominium “right of ownership”, referring to a territory formally shared by different powers) — is a new format for international galleries to collaborate in exhibition-making. 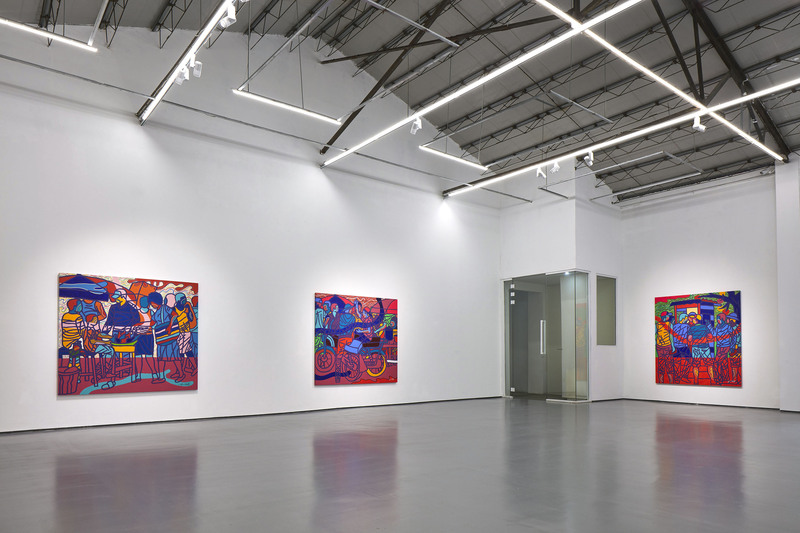 This inaugural edition of Condo Shanghai will include nine participating local galleries from Shanghai, which will welcome and share their spaces with thirteen international galleries, displaying major works by artists they represent alongside those of the invited galleries.